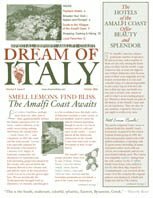 Guidebook author, Barrie Kerper , guest editor of this issue explains what makes the Amalfi Coast so special. Reviews of six hotels in Amalfi, Positano, Ravello and Praiano. Amalfi Coast and the best private guides and private drivers to lead the way. Where there is to see and do in Amalfi, Positano, Ravello, Praiano, Atrani, Furore, Concadei Marini, Maori, Minori, Cetara and Vietri sul Mare. A guide to the Amalfi’s best shopping, especially for ceramics. Lemon Lifestyles offers cooking lessons on the coast. Take a hike along the Amalfi. Where to eat. Getting around. Why fly Eurofly to Naples and the Amalfi Coast. We ask the experts — Leni Attanasio, owner, Palazzo Murat; Faith Willinger, cookbook author; Giulia Sersale, supervisor, plants and flowers, Le Sirenuse; Carla Capalbo, cookbook author — about their favorite hotels, restaurants, stores and secret places on the Amalfi Coast.